An actual castle where New York Yankees All-Star Derek Jeter spent his childhood summers and Derek bought for his own in 2002. At just age 44, retired New York Yankee Derek Jeter, 14-time All Star, future MLB Hall of Famer and now co-owner of the Miami Marlins, has accomplished more than most would in many lifetimes. With an estimated net worth of approximately $185 million, it’s not surprising that he owns homes in New Jersey, New York and Florida. However since recently charged with overseeing the day-to-day operations to reinvigorate the last-place Marlins, Jeter has less time to get to his properties as often as he once did and has put his New York Tiedemann Castle on the market for $14.75 million. It seems fitting that one of the Yankees royalty would own a castle. 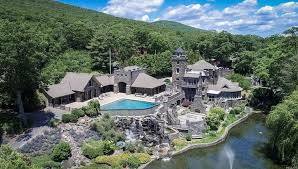 Built in the early 1900s on Greenwood Lake on the border of New York and New Jersey by a New York doctor, Rudolph Gudewill, for his wife, the estate is actually two castles – the master castle with a connected tower and a guest castle. After Gudewill died, John and Julia Tiedemann bought the castle where they lived with their 13 children including an adopted son, William “Sonny” Connors. Connors was later to become Derek’s maternal grandfather. While Derek’s parents moved to Michigan when he was four, he spent many of his childhood summers at the castle swimming, playing sports and chores. Jeter not only came to love the castle through his grandfather, but his grandfather’s love for the Yankees and belief that achievement comes with hard work. In interviews, he credited lessons learned from his grandfather as a key to his professional success. The Tiedemanns sold the estate in 1996, but when it came back on the market in 2002, Jeter bought it and began a long and expensive restoration. Loaded with rustic atmosphere and many stunning architectural features such as the soaring wood-beamed ceiling in the great room, large stone fireplaces, stone turret and a stone bridge traversing a lagoon, many elements duplicate what one would find in the European castles in history, making it feel very authentic. Greenwood Lake was one of the East Coast’s most popular resort town in the late 1800s and early 1900s attracting celebrities including another Yankee legend, Babe Ruth, who was a frequent visitor. The seven-mile lake, restaurants and rural atmosphere still attract many visitors from New York City, New Jersey and Philadelphia. Sited on four acres, the immaculately restored greystone compound consists of the main castle, a guest castle, pool house and boat house located at the edge of nearly 700-feet of Greenwood Lake’s shoreline. Measuring 11,000 square feet, the main house is perfect for extended family or as a corporate retreat with water sports and enjoying the extensive partially covered terrace with infinity pool overlooking the lake. The rusticity and visions of roaring fires in the stone fireplaces would also ensure magical winter holiday gatherings. Living areas in the main house include six bedrooms, seven full and five half baths, great room, four kitchens, multiple stone fireplaces including one on the terrace, dens, game room, sunroom, office, formal dining room, gym and family room with a bar. The turret opens out to a widow’s walk which is duplicated on the guest house, both providing beautiful lake and wooded views. There are extensive gardens, a Statue of Liberty replica and a four-car garage. Even with a large number of guests, there is always a quiet place to spend some alone time. Rurally located but only 50 miles from Yankee Stadium, Derek Jeter’s Tiedemann Castle is the perfect getaway spot for New Yorkers or anyone to bring their friends and family and get away from the hectic, noisy work-a-day world of city life. Priced at $14.75 million, the listing agent is Diane Mitchell with Wright Bros. Real Estate, Nyack, New York.